The updates and changes to the 2019 Ford Edge offer more power and style to drivers than ever before. With four available trim levels - SE, SEL, Titanium, and ST – there's a Ford Edge for every driver. 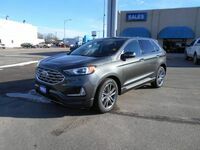 We at Wolf Auto Center often get asked what the differences are between the different Ford Edge trim levels, which is why we put together this comparison to show you how the SEL, Titanium, and ST trims compare. 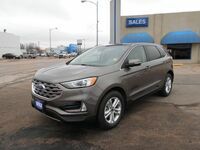 The 2019 Ford Edge SEL and Titanium are available in 10 striking exterior color options - Agate Black, Stone Gray, Baltic Sea Green, Blue, Ruby Red, Magnetic, Burgundy Velvet, Oxford White, Ingot Silver, and White Platinum – while the Edge ST offers six sleek color options – Ford Performance Blue, White Platinum, Ruby Red, Agate Black, Ingot Silver, and Magnetic. Keep reading to find out more about how these three trim levels compare or click the link below to view our full in-stock Edge lineup. What are the differences between the 2019 Ford Edge SEL, Titanium, and ST? The 2019 Ford SEL and Titanium come standard in front-wheel drive configurations and are also available in all-wheel drive. The Edge ST is available only in all-wheel drive with its powerful 2.7-liter V6 EcoBoost® engine. 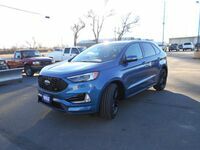 This Ford Edge powerhouse offers ST drivers 335 horsepower and 380 pound-feet of torque while giving drivers the option of shifting into Sport mode for a more powerful feel on the road. The SEL and Titanium Edge models are powered by a 245-horsepower Twin-Scroll 2.0-liter EcoBoost® Engine that offers 275 pound-feet of torque. Each of these Edge vehicles’ engines is mated to an eight-speed automatic transmission. Bright grilles are on display at the front of both the Edge SEL and Titanium while the ST models feature a trim-exclusive gloss black-painted mesh grille with ST logo. Edge ST models are fitted with standard 20-inch bright-machined aluminum wheels with high gloss black-painted pockets and offer available 21-inch premium gloss-black painted aluminum wheels. The Ford Titanium wears 19-inch nickel-painted aluminum wheels and the SEL wears 18-inch split-spoke sparkle silver-painted aluminum wheels. Are you looking for more information on the 2019 Ford Edge? Contact our staff at Wolf Auto Center in Ogallala, NE by phone or online!